The Market Square was traditionally the social and commercial heart of Talgarth. It was the venue for livestock sales on fair days (pictured right) and for public meetings. As the Methodist “Revival” swept across Wales in 1904, students from Trefeca theological college held prayer meetings in the square. A young Methodist called Rhys Thomas Prydderch often held open-air services in the Market Square. He hailed from Lower Geuffordd, Talgarth. He was well known for his visits to the sick and elderly in Talgarth and Bronllys. He had studied at university in Cardiff and at Carmarthen’s theological college before becoming a pastor, initially in Swansea and later in Hay and Clifford. When the First World War broke out, he tried to enlist but was refused because he had suffered a leg injury as a boy. After four attempts, he was eventually admitted to an army labour battalion. In March 1917, a week or so after arriving at the Western Front, Private Prydderch died in a military hospital in France, aged 34. During the war, market stalls in the square raised money for the Red Cross, which was treating wounded servicemen. 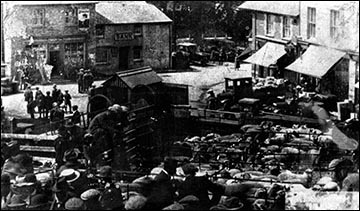 For example, in October 1915 poultry and produce donated by local farmers raised almost £16, and goods donated by Talgarth traders raised almost £13. This was part of a wider effort by Talgarth which raised nearly £63 in total – c.£6,000 in today’s money. In 1916 a Miss Garland, from the government’s Board of Agriculture, addressed a meeting in the square to urge women to help on farms, where there was a labour shortage. Tasks deemed suitable for women included picking stones, milking and feeding livestock.